Examples of the art of dyeing fabrics exist from the period of the Indus Valley Civilisation, however the origins of block carving are now lost among the pages of history. It is believed that this art was developed and specialised by artisans who were traditionally carpenters and the techniques may have been borrowed from Iran at the time of the Mughals. The skill then travelled to Sindh and further east to the Indian states of Gujarat, Rajasthan and Madhya Pradesh. 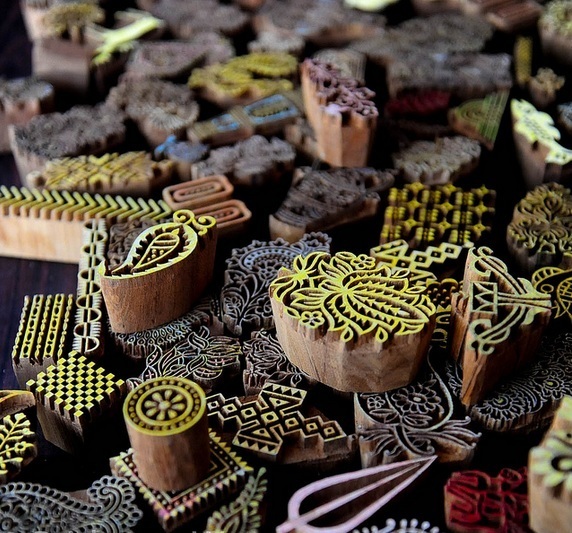 Among the surviving craftsmen of this endangered art are the wooden block makers of Pethapur, a village that lies in the Gandhinagar district of the north-eastern region of Gujarat. Most craftsmen engaged in wooden block carving today have been practising this profession for nearly 300 years. A commonly held belief among this group of artisans is the story of how this craft originated among their ancestors. They believe that centuries ago women began to use bangles dipped in colour to create patterns on their garments, having grown tired of the unembellished white clothes. 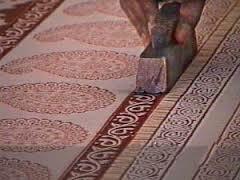 This practice was then adopted by carpenters who began to create new designs for use on garments, thus giving rise to the tradition of hand-block printing on textiles. The Gajjar community of block makers are the chief practitioners of this craft today and were closely involved in fabric trade with the Kingdom of Siam (now Thailand). 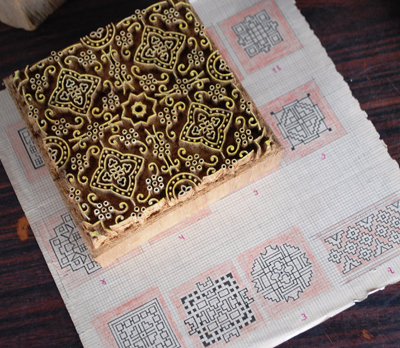 Thai patterns were interpreted on to wooden blocks before being sent to Ahmedabad for printing. This trade continued until World War II when the axis blockade signalled a death blow to the Saudagiri trade route. At the time when this craft flourished, Pethapur village had more than three thousand artisans crafting wooden blocks for hand-printed textile crafts. The process has not altered much in the workshops of Pethapur since those days, and is carried out on a block of teak, which is first smoothened and polished with sandstone, water and a file. Teak is chosen for its strength, ease of availability and its waterproof nature and the block is painted white to make the design more visible to the artisan. This is followed by the process of hand-illustration of the design before it is transferred on to tracing paper. Finally the design is engraved on the wooden block by using a small pin pierced through the design and onto the wood. Following this pin-holed design, the wood is carved with a hand drill and a range of chisels, a procedure that requires painstaking precision. Blocks range in size from a few centimeters to several inches and could take anywhere from a single day to one week to complete. The journey of a carved wooden block created in Pethapur begins from the artisan’s workshop and culminates in the varied textile designs that are embellished with its intricate patterns. The skilful art of these gifted craftsmen will continue to live on as long as it is combined with the unique aesthetics of contemporary designers and celebrated by craft-conscious customers. Posted in Crafts, Gujarat, Textiles and tagged Block-printing, Crafts, Gandhinagar, Gujarat, Indian Village, Indus Valley Civilisation, Indus Valley Civilization, Mughals, Pethapur, Teak, Textiles, Wood carving, wooden block, wooden blocks, wooden block makers. Bookmark the permalink.